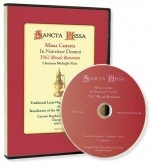 This DVD shows the High Mass for Christmas in Latin according to the Extraordinary Form of the Mass (Missale Romanum 1962). The Holy Father, Benedict XVI, says ... what earlier generations held sacred, remains sacred and great for us too. The President of the Pontifical Commission Ecclesia Dei, Cardinal Castrillon Hoyos, says that the use of the pre-Vatican II Mass in Latin is not a step backward, but a sign that the Pope wants to make available to the Church all the treasures of the Latin liturgy that have, for centuries, nourished the spiritual life of so many generations of Catholic faithful.